Why purchase one gnome when you can buy a complete set? Your home and garden simply need the company of these little whimsical creatures. 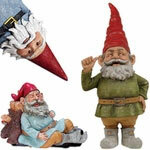 Collect all of our GardenFun sets or purchase as a gift for the gnome-lover on your list. As always, our gnomes are made with a cast stone resin that will resist wear and tear caused by outdoor elements. Our gnomes won’t chip or fade, keeping your garden looking gnometastic for years to come! Our gnome sets include our bright texting gnomes and gnomes with attitude. Our texting gnomes are laugh out loud funny, with phrases like “X.O.X.O.” and “L.M.A.O.” written on their handheld signs in bold lettering. 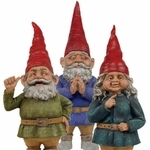 We guarantee that these four 13-inch gnomes will keep your guests amused as they walk through your garden. If you are looking for really outrageous gnomes, try our very sarcastic set of four gnomes with attitude. 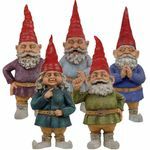 Each of these four brightly colored gnomes comes holding a surprisingly sharp-witted sign, including phrases like “BITE ME!” and “GO AWAY!” Keep squirrels and rabbits out of your garden with these 13-inch rambunctious gnomes. While our unruly gnomes are certainly entertaining, many prefer our traditional gnome sets, including the customer-favorite Toad Hollow clan. Choose from 8.5, 15, 20 and 32-inch Toad Hollow sets of five or six gnomes each to complete your garden’s decorations. These popular gnomes have the weathered, wise and cheerful gnome faces we know and love. Our miniature gnome sets are also designed with the classic gnome legend in mind. 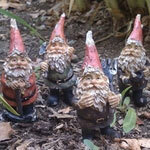 Add our miniature working gnomes throughout your garden. 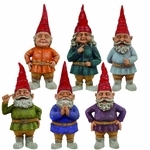 There’s simply no better way to protect your flowerbeds than with our working gnomes. Visitors will love to search your garden to find all six. GardenFun also carries shelf sitter gnomes that can perch on nearly any ledge to keep watch on your home and yard. Sit these six together or spread them out to spread their whimsy throughout your backyard.